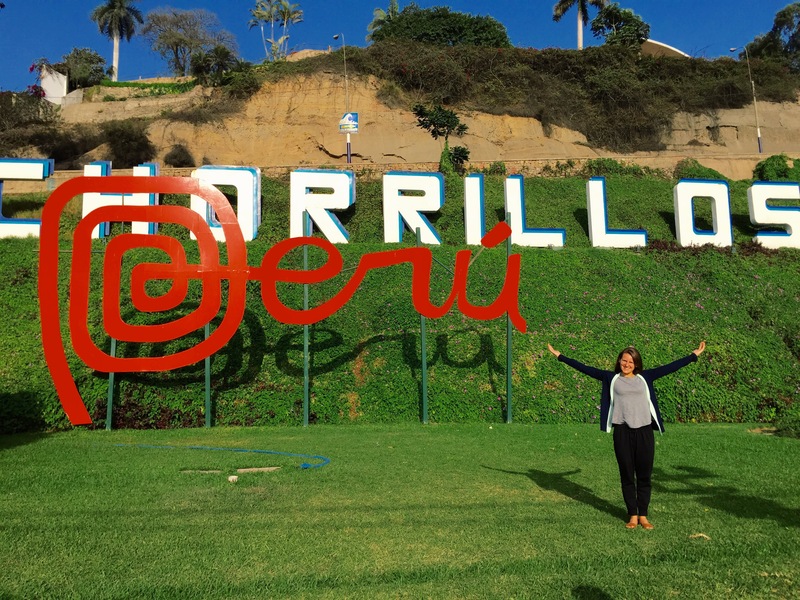 My Peruvian Adventure ended just the way it started… With a delayed flight. It seems as though the Peruvian people just didn’t want to see me go! After a 2 hour flight delay, a missed connection leaving me in the Miami airport for 12 hours, and a week in the hospital after contracting a waterborne virus, my second journey to Peru has finally come to a close. As I reflect on my travels, my set backs, and the countless stories of my adventures I am left to answer a simple question- was it worth it? My answer, absolutely. It took me a while to write this concluding post for a number of reasons. I spent the past two months recuperating from my rocky return, focusing on my studies, and also trying to formulate into words all that I experienced during my two summers in Peru. Despite living in the same room and working in the same clinic, my two trips could not have been any more different from one another. If I could sum up my adventures into one sentence it would be as follows: I lived, I learned, and most of all I loved. I was once told that a picture is worth a thousand words, so here are more than a thousand words that capture my gratitude and love for the Oasis of amor y esperanza in Chimbote, Peru. This was hands down one of the most trying yet rewarding journeys that I have ever been on. I was pushed to my limits both physically and emotionally from the start of my trek up until the very end, but looking back I wouldn’t trade the sweet moments with the patients and children for anything. I did not take this journey alone, and I have to offer my utmost gratitude to the many people who helped me along the way. To the Sisters who welcomed me to the place that they have poured their heart and soul into over the past 50 years, to the patients who opened their homes and consultation rooms so that I may observe, and to the workers at the Maternidad who were always welcoming to my curiosity and desire to learn-muchisimas gracias. To my huge support system back home- your well-wishes, texts, comments and FaceTimes meant more to me than you will ever know. I am so blessed to have so many people who were so supportive of my journey, and who have come to love the people of Chimbote through my photos and stories. To my Mom and Dad- thank you for never squashing my rather large aspirations, for always supporting my dreams, and giving me the courage to follow my heart wherever it may lead. To the people of Chimbote- gracias. Thank you for opening your heart and sharing your stories with me, the words and struggles you shared with me will forever be etched in my heart, and you will forever be a part of my life story. Lastly, to the children, “my babies”. Thank you for your unconditional love, for opening up parts of my heart and soul that I never knew existed. I wish you nothing but happiness and joy in your lives ,and pray each day that you will get the love and attention that you so rightfully deserve. You are all beautiful, intelligent, and resilient. May life never dull your precious and contagious smile. Please know that if I could adopt you all I would, and that you will be carried in my heart forever. My life and my heart will never be the same. Thank you for following me along on this special journey and for allowing me to share the faith, spirit, and love of the people of Chimbote with you for the past two years. The past few days have left me faced with a range of emotions combined with an even greater range of questions running through my mind. I have questioned whether it was worthwhile for me to have returned to Chimbote for a second time. I wondered if I was making any sort of impact on the community, and after several long days at the Maternidad I longed to return home to Providence to be surrounded by the comforts of home, my family and my friends. I repeatedly asked myself “why am I here?” My answer came to me in a reflection with a friend over M&Ms and Oreos this afternoon. I was called to Chimbote to be a source of love to the people. Through this trip I have been able to give of my heart, to love with all my heart, and to find the place where my heart is filled with gladness as I provide the love and attention that the children and people of Chimbote so desperately hunger for. I was able to realize that I have been called in such a special way by God to serve and to love the people with whom I work each day, and that, despite my hesitations, I have been so very much blessed to have had this second opportunity. Amor y esperanza. Love and hope. The Materindad de Maria was created to be an oasis of love and hope amid poverty and violence. This week I have been exposed to a great deal of poverty and violence that have left me without much hope wondering where the love has gone. On Saturday I participated in a walk to end women’s violenc e. Violence against women is a huge problem in this region, and the walk was the first time that the public had taken a strong stance in support of the women. The day after the walk, I learned that one of the women I had walked alongside of was shot and killed by her husband because of her participation in the march. I then traveled to one of the poorest houses that I have ever seen. The family lives in a tiny one bedroom house that is furnished with one twin bed, one light, and one gas burner. The father is a diabetic and paralyzed from the waist down, the children ages two and four are undocumented, and the wife is pregnant with their third child. Ellie and I spent two hours after the visit going from community to community searching for an empty house that the family could relocate to, and were unsuccessful. The following morning the wife gave birth to a beautiful baby boy. I stood beside the mother and child in the maternity ward after the birth and questioned what life the baby boy would have. We returned to the house later the next day only to find that the father had not fed his two children since his wife had gone into labor. I looked at the room and at the children and held in my tears. My heart so strongly wanted to scoop all three up and bring them back to the house with me- to bathe them, dress them in clean clothing and feed their hungry tummies. I instead ran to the market, bargained to get as much food as I could with only one sol, and returned to the house watching to ensure that the father fed his two children. Where was the love and hope in this situation? That afternoon, despite the morning’s heartbreak, I was able to celebrate Sandra’s second birthday. The local Lion’s Club threw a huge birthday bash for my sweet girl complete with candies, cake, dancers and a piñata. 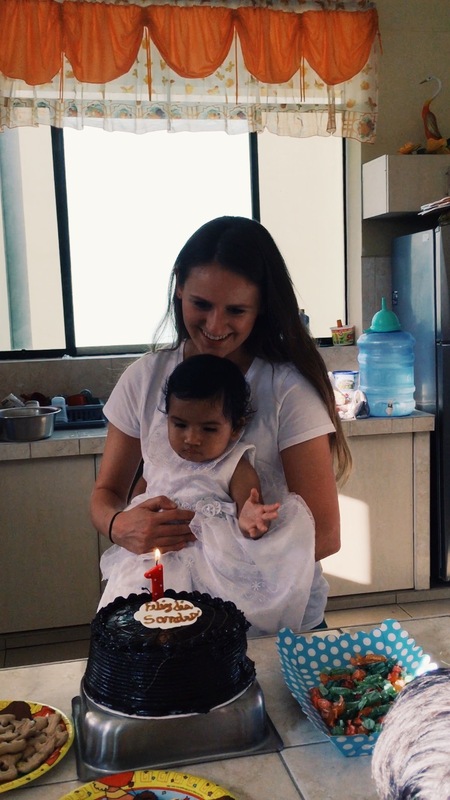 I am so very blessed to have spent the past two years celebrating her birthday, and although it breaks my heart to see her celebrating her birthday in the orphanage, I am so very grateful for the compassion, love, and care that she and the other children receive. As much as I love the home visits, I always look forward to my afternoons with the children. Watching them giggle as we run around the yard chasing bubbles, lifting them high in the air, and dressing them in Providence College gear hoping that they might one day become future Friars brings me so much joy. Despite the heartbreak, poverty, and violence that surround me the children renew a sense of hope within my soul. They crave my attention and love and they remind me of the things that matter most. I hold the people of Chimbote in my prayers each day as I hope and pray for an end to poverty and violence, and work each day to be a beacon of amor y esperanza as I fulfill my special calling. I saw the sign on the window of a house early Saturday morning on home visits- it reads in English “There is no water.” Sunday morning as we walked to Mass we noticed masses of people lined on the street corners with large plastic containers. Sister Margaret Mary remarked “is there a tupperware sale going on that I didn’t know about?” The reality was that there was no tupperware sale, but that our neighboring district, La Libertad, no longer had access to running water. They would go without water for a total of 5 days as the main line that provides water to the district and surrounding areas had ruptured. As I walked, I watched the large mass of people wait in hopes that a truck would soon arrive with water to fill their buckets so that they could go on with their daily lives. I watched them waiting in line, thinking about how lucky I am to be blessed with access to running water, something that so many people around the globe unfortunately do not have access to. No matter where I travel, people are always waiting in line- waiting for water, for food, and at the clinic to receive medical care. I stand in awe at the lengths these people will go to receive the basic necessities that I take for granted back home. They wait, and they wait, and they stand in line and wait a little bit more. The Maternidad itself is expanding and construction is now taking place to build a new two-story clinic. I emphasize the two stories because everyone in the Maternidad is obsessed with telling me how it will not only be brand new, but will have two whole floors. This renovation has caused the location of the posta to shift to a multipurpose classroom at the back of the clinic. Had I not been to the Maternidad before I would have assumed that the clinic would have always been housed in the classroom. Temporary partitions have been put up which house five consultation rooms. The waiting area is filled to the brim with patients both young and old, and the line to get into the posta extends along the sidewalk each morning. A small covering has been placed over the sidewalk waiting area to shield patients from the sun as they wait to see the doctors. The construction has not stopped the clinic from providing for their patients. 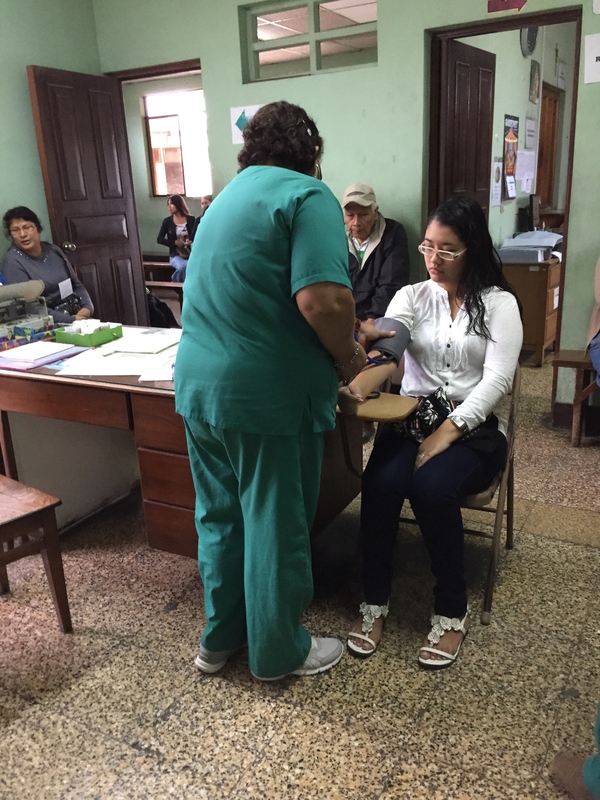 Today alone a little under 1,100 patients were seen in the Materidad. The nurses trekked out on 215 home visits during the month of July seeing roughly about 8 patients a day. I have been spending the majority of my time going on home visits. Everyone in the clinic, myself included, are amazed at how well my Spanish skills have improved even without speaking the language since I last left Chimbote. I am now able to hold conversations with staff and patients alike without hesitation, and am able to understand almost all of the conversations the nurses and doctors have with their patients (I now only wish that I was not leaving the country in 8 days). I entitled this post “In between the lines” not only because of the number of masses of people lined in the streets or in the posta this week, but because of my new appreciation for the work of the Maternidad and the patients that they serve through my understanding of their language. Sunday morning in during Mass I noticed a woman sitting in a wheelchair at the entrance to the Church. I later recognized her to be a patient of the Maternidad that I worked with almost on a daily basis last year. Señora G has diabetes. Poor management of her condition combined with sparse medical care had led her to develop ulcers on her right foot. Each day she would travel to the Maternidad so that we might clean her wounds and change her dressings. I would always venture into the room with her to assist with the cleanings as I was not only intrigued by the magnitude of the wound, but also her incredible tolerance to pain. I had hoped that the daily care would have helped to lessen the severity of the wound, but as I looked at her in the chair, I had learned that in the past year she had to undergo an amputation of the limb. The moment she saw me, her face lit up. We spoke for several minutes talking about my studies, my return for “such a short period of time”, her family, but also how she had been improving since her amputation. I was joined by two new visitors to Peru, the grand niece and nephew of Sister Margaret Mary. I explained how I knew Señora, and also shared details of her condition. They were astonished at the fact that she would loose a foot because of her diabetes, they questioned why she was not on insulin and why she (and her doctors) weren’t able to control her condition. Welcome to third world medicine, I remarked. Returning for a second time has allowed me to view things in a different light. The shock that I first experienced, much like that of my two American counterparts, has faded as I have come to understand this way of life which vastly contrasts the life I know back home. In my last post, I talked about the man with the paralysis of his legs and how he had not seen a doctor solely because he could not afford to do so. I stayed up late the night we visited him searching the web for possible diagnoses for his condition (my guess was muscular dystrophy, but it didn’t explain th e problems with his hands). The next morning I watched as Señor D was wheeled into the clinic by his older brother. 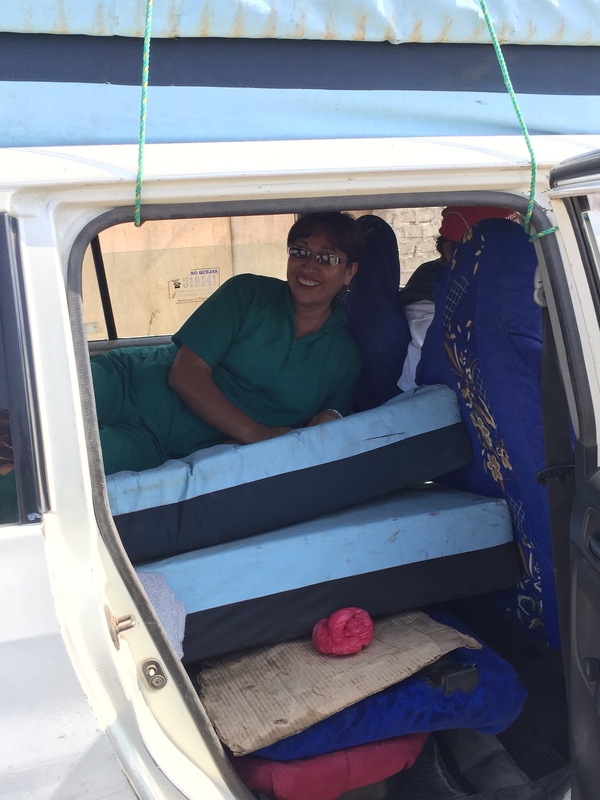 They had managed to come up with enough funds to get transportation to the clinic and we would provide a consultation with a doctor and physical therapist for no cost. Turns out that he does have muscular dystrophy and that his hands were clenched together from almost 10 years of trying to walk with crutches. His care is now under our therapy unit as they work to loosen the stiffness in his hands and work with him to strengthen his leg muscles.We were able to visit his house again to meet his sister (pictured above) who is also suffering from a form of muscular dystrophy. 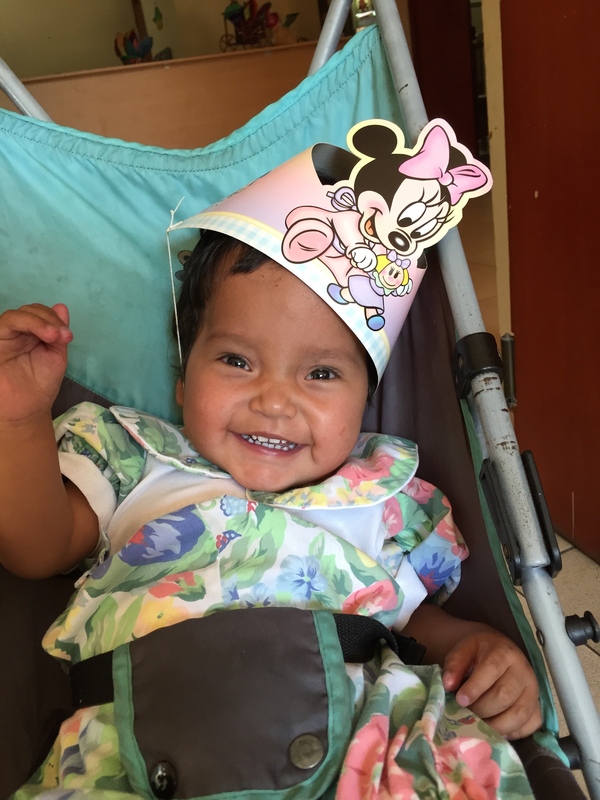 Her condition is much more severe, but she will be receiving care from the Maternidad’s therapy unit to strengthen her muscles as well. 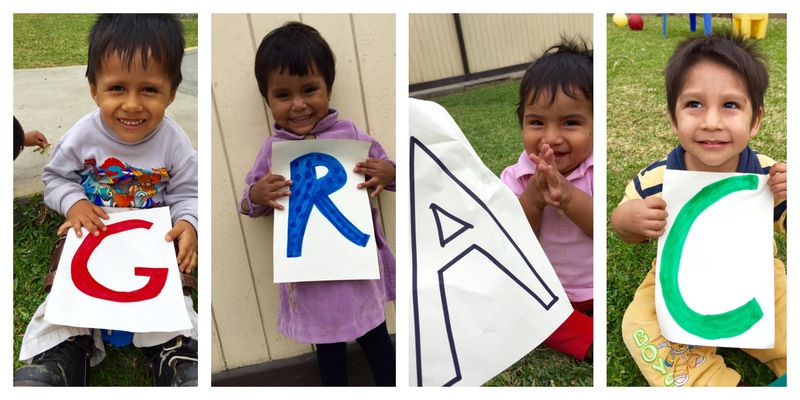 It’s stories like theirs that make the trek into the barrios each day worth it. The thing I like most about this work is that it couples both medicine and empathy so beautifully. The home visits allow us to sit with the patients, to hear their stories, and then work with them to provide the necessary course of treatment. The problem, however, lies in the unequal distribution of the health care and also the cost associated with receiving treatment which leave those like Señor D, his sister, and Señora G to receive treatment right on the cusp of it being too late. The past week has afforded me so much time to think,to read between the lines and come to understand so much about the Peruvian way of life, the field of medicine and how it all intertwines with my call to serve. This post has been my hardest to write as I struggle with finding the words to convey what I have seen and what has lied both in my mind and in my heart over the past week. Amid the heart break and the questioning I have found solace and inspiration. I so very much look forward to all that the next few days have in store and forever will consider myself blessed to have been welcomed into the hearts and homes of the people of Chimbote. I’d like to rephrase the title of this blog to: When there’s a Williams, there’s a way. A year ago I was packing my bags ready to depart from my Father Smith Fellowship in Chimbote, Peru with a heart that was broken and mended from the lives and the stories of all whom I encountered during my stay. I said my final farewells to those who I had come to know, cherish, and love, and left Sister Margaret Mary at the bus terminal as she said “this is not goodbye, but rather see you soon because I know you will be back.” I hugged her close and laughed thinking that it would be a long time before I would return to Chimbote. There was not a day that went by where I did not think of or pray for mis amigos in Chimbote. In my daily intentions I would pray for the wellbeing of the community, for the growth of the clinic, and for homes for the orphaned children who caputured my heart. I also (somewhat selifshly) prayed that it would be God’s will that I would one day return to serve at the clinc. My determination unceasing, I applied for and was granted a Santander Global Service Learning Grant which afforded me the opportunity to venture back to Chimbote. There were no words to contain the joy in my heart nor the excitement I had to be making this journey for a second time in under two years. Flash-forward to the well anticipated DEPARTURE DAY. Two bags and a carry on stuffed to the brim with donations from generous family and friends in hand I headed to the airport to embark on my adventure. Little did I know that my adventure would be had in my attempt to get myself and my bags to Peru! Long story short, my intitial flight from Boston was delayed which would cause me to miss my connecting flight to Peru. I was placed on an earlier flight, but learned, after landing, that my bags were not on the flight (cue huge panic and frantic call to Mom and Dad). I decided to continue on my way without my bags hoping they would find their way to Lima the following day only to learn at the last second prior to boarding that my flight had been canceled because they had no pilot to fly the plane. However, things have a funny way of working out and I willed myself to not let this setback dampen my spirits. Nothing, not even missing baggage and a flight with no one to fly it would stop me from going to Chimbote. Like I said, when there’s a Williams there’s a way! After much re-arranging I found myself lucky to be hosted by a close college friend and her family who lives in Dallas for a few days and a ticket on the Monday night flight to Lima. After even more anticipation for my arrival, I (at last) made it to Chimbote late Tuesday afternoon. In the days preceding my trip I began to wonder if things would be the same upon my return. Would I be as excited to brave the barrios on home visits each day as I was when I first received my red lunch box turned medical bag? Would my Spanish come back easily after not speaking the language in almost a year? Would the children remember me? All of my questions were answered as soon as the bus pulled into the station in Chimbote. Things had not changed, and it was as though I had never left. I arrived to the Maternidad in the late afternoon to be greeted by numerous staff welcoming me back, but the happiest welcoming came from the children. I wished that I was able to capture the moment on video, but I know that it will forever be engrained in my heart. I entered the playroom to a chorus of children gleefully saying HOLA! From the corner of the room I noticed my little Sandra, she looked at me closely then smiled and came running into my arms laughing and smiling from ear to ear *cue huge waterworks from me. * The connection we had was still there, despite her being several inches taller, developing a very fierce personality as she settles into her “terrible twos” phase, and a new found love for the word “no”. I hopped right back into the rotation at the clinic the following morning accompanying on home visits. The poverty that exists in the country is still a shock to me, and I so very much take for granted all that I have back home. Today on home visits we encountered a 25 year old patient with an unexplainable paralysis of his legs and hands. He had never seen a doctor. I was perplexed at not only his condition, but also why he had never sought treatment or a diagnosis. The answer was simple, he had no money. The mission of the Maternidad is to provide adequate healthcare to all regardless of economic status, so tomorrow the young man will be coming to see a doctor and receive therapy to hopefully assist with allowing him the chance to walk and use his hands. When I am not out on home visits or in the clinic I can be found with the babies. I am so impressed with how much they have all grown and stand in awe as I watch my babies who are now toddlers roam around each with a very distinctive personality. Although I haven’t taken many photos yet, I couldn’t resist including two then-and-now pics! Above is a picture of Pedrito last year on the day he entered the Maternidad, found in a public restroom with his umbilical cord still attached and born several weeks premature, as well as a picture of the handsome one year old today! Below is a picture of Kenlly and I as I carried him on my shoulders around the yard. The last time I saw him he was recovering from surgery for his cleft lip and palate, and now he is a boy full of personality with the most infectious smile!! There was a lot of will in this Williams gal, and I finally made my way to the place and the people who hold such a large portion of my heart. I am so very blessed to be back serving the people that I love, but for also having the opportunity to share their stories with all back home. Although my trip to Peru was a long one my journey has only just begun! According to my timehop (a mobile app that displays photos, social media posts, etc from previous years), a year ago today I arrived at the Maternidad de Maria orphanage for the first time. It is absolutely crazy to think that it has been a whole year since I embarked on the most formative journey/experience of my life. Each and every day I thank God for having had the opportunity to have served the people of Chimbote last summer, but also for the opportunity to be going back in a mere 30 days! That’s right 30 days from today I will don the green scrubs once more and return to be embraced by tons of sloppy kisses from my little friends in Chimbote! So join me in backtracking for a minute to fill most of you in on how I finagled my way into returning to Chimbote for the month of August. Last December, still in my missing Peru and all of my Peruvian pals funk, I stumbled upon an email from the Providence College Center for International Studies. The subject line read Are you interested in spending the summer abroad? Followed by Are you in need of financial support to achieve that dream? My answer to both questions was YES (flights to Peru do not come cheap and I am a college gal on a budget)! I read through the rest of the email and decided that this might be my opportunity. Since my return from Peru last August I had always longed to return. I had envisioned taking a gap year prior to starting any graduate programs and spending my time away from my textbooks by fully immersing myself in the community of Chimbote. While post grad life seemed so far away, the thought of returning inspired me to continue going full-steam ahead with my coursework. The prospect of returning a year early to Chimbote was so very enticing. Without giving it a second thought I decided to apply for the Global Service Learning Grant. I told no one about my application process figuring that I would not be awarded the grant due to my fellowship the previous summer. However, in early April I received another email from the International Studies office stating that I had been awarded the grant and would indeed be returning to Chimbote for the summer of 2016! After a quick celebration that consisted of yelling, crying, and jumping up and down in my dorm room I decided it would be best to tell my parents of both my application and acceptance into the program! (Update for all of you who know my parents: Dad was very excited and Mom immediately went out to buy clothing for the children- typical). 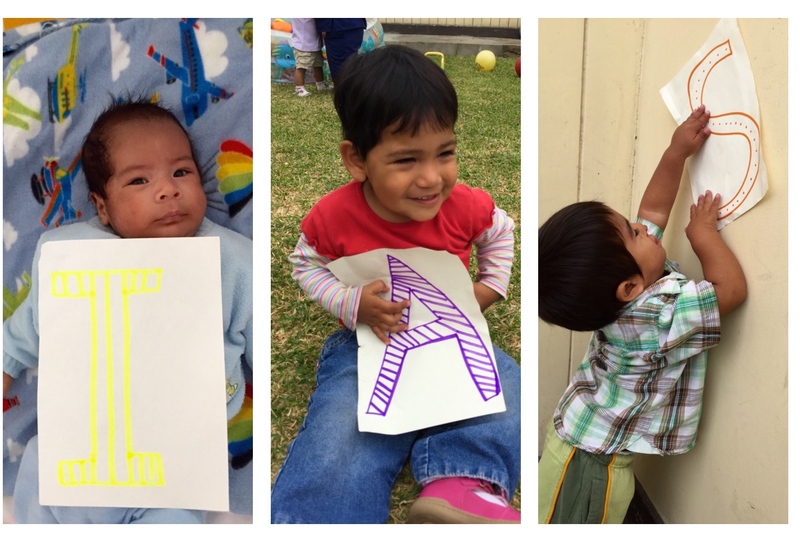 With much joy in my heart I am so very excited to officially announce part 2 of my Peruvian Adventure and look forward to continuing to share the stories of my work at the Maternidad de Maria clinic and orphanage with each of you. Please keep me and all those with whom I will be working in your thoughts and prayers, and get ready for an influx of pictures of the children to your inbox in just 30 days! Is it acceptable to both smile and cry? Forty-four days ago I departed to my destination 4,042 miles away from everything that was familiar to me. At that time I said goodbye to my family and friends and looked with optimism towards all that awaited me on the other side of the equator. As I say my final goodbyes to the strangers that have become my family and to the country that now holds such a special place in my heart I find it hard to control my feelings. I am excited to return home to see my parents, to pack my bags and head back to PC for my junior year, and to (finally) enjoy a cup of Starbucks coffee. I am happy to have seen and experienced all that the Centro de Obras Sociales Maternidad de Maria has to offer, to have fallen so deeply for the sixteen children who I so wish were coming back to America with me, and to have had such a positive experience over the past two months. But with this excitement comes sadness and guilt, sadness to leave all that I have come to love behind and guilt to know how vastly different the world I will return to will be. Amongst the roller coaster of feelings that I have been experiencing, I was also able to have an amazing last week in Chimbote. Friday began the first of my “lasts” here in Chimbote as I departed on my last home visit. I remember how excited I was the first day I received my little medical bag, and how I couldn’t wait to share my experiences on the blog. I was so very fortunate to have met so many wonderful people on home visits. Each day and each story was so vastly different, but the one common element that each person had was gratitude.On my last day I brought a PC friars shirt with me. I had no set destination for this shirt, but wanted to give it to someone so that a piece of Providence would always remain in Peru. We visited a woman who has thyroid cancer. Her cancer, which is untreatable, is completely consuming her. She no longer has feeling in the right side of her body, her arm has gone limp, and the tumor that she has now has engulfed her throat making it hard for her to talk. Her mother has also recently been diagnosed with cancer. As we talked to this woman, I decided that my shirt should go to her. I explained that I had received this shirt from my school and that I wished for her to keep it. 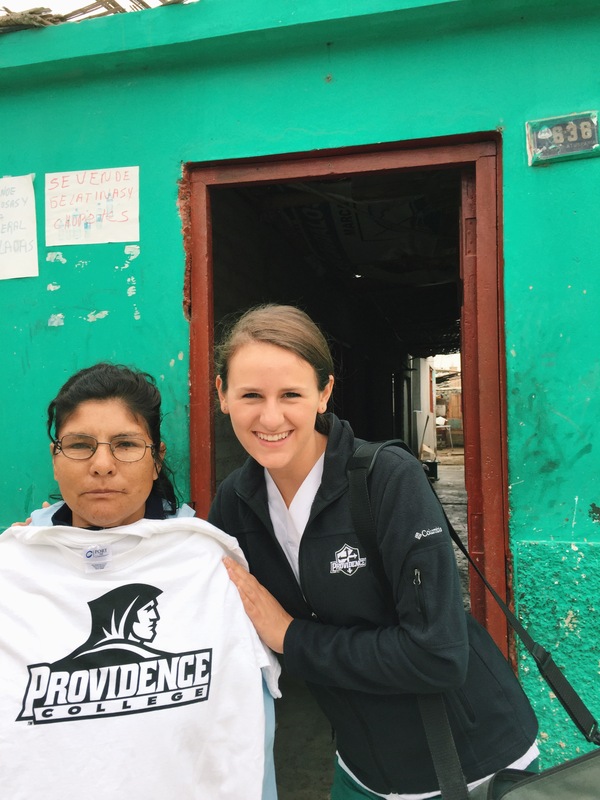 She was so excited and grateful to receive the shirt and even attempted to say GO FRIARS (which was written on the back of the shirt). Sandra, my favorite little girl celebrates her first birthday on August 18th. Because I will be traveling home and no longer in Chimbote I decided to celebrate her birthday before I left. 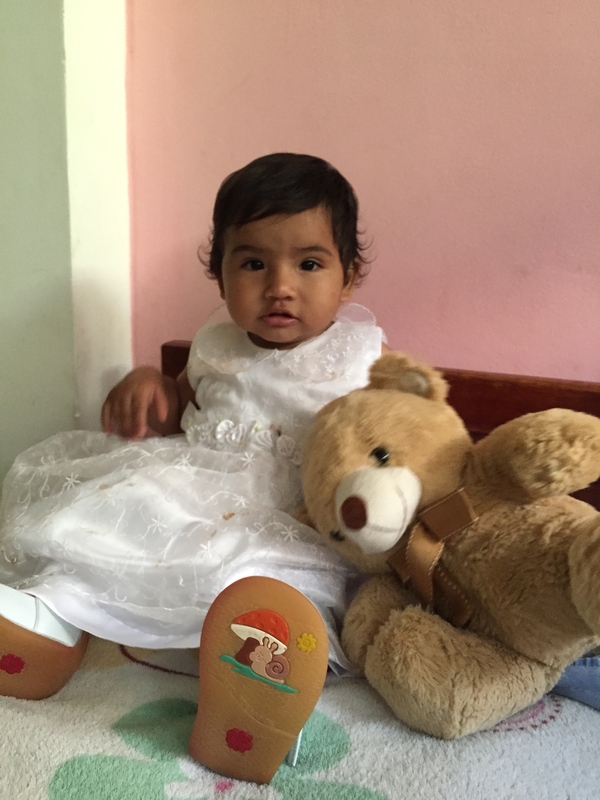 First birthdays are a very big deal here in Chimbote since for so many years many children did not live to see their first year due to poor prenatal care and horrible postnatal care in the home. 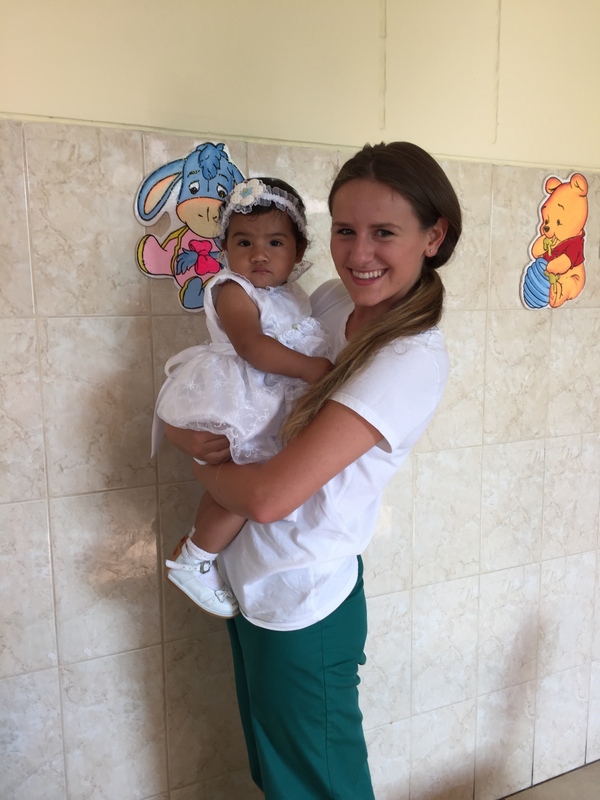 Every person in the maternity knew that Saturday afternoon was going to be a special one and a huge celebration for “Kate’s princesa” would be held around three o’clock, I say “around” because nothing is ever right on time here in Peru. This celebration was complete with chocolate cake, candies, popcorn, music, dancing and of course, a lot of laughter and love. I am so glad that I was able to share in this special day with my sweet girl. On Monday I was able to visit Kenji in Lima, who had recently undergone surgery to repair his cleft palate and cleft lip. 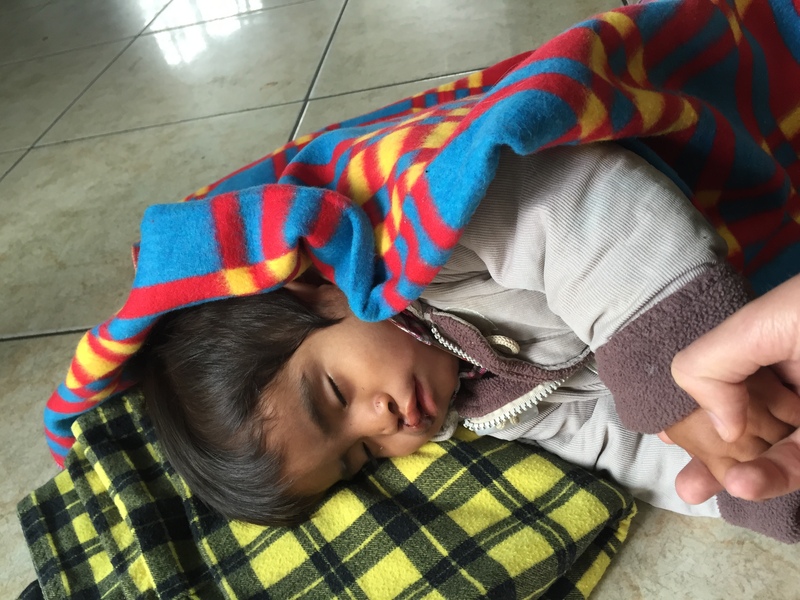 Kenji was found malnourished on a home visit and was taken into the care of the Maternidad right before I came to Peru. Donations to the center we are able to provide this little boy with a new chance on life and a new smile. I met Kenji in Lima before I headed to the airport and before he boarded the bus back to Chimbote. He had been agitated and hadn’t been able to sleep much since his surgery, but after a few minutes in my arms he decided it was time to rest and fell fast asleep on the floor (the only place he wanted to be) holding my hand. Before and after! Doesn’t he look handsome? Each day after morning prayers Sister Margaret Mary would remind us to keep the values of Faith, Service and Love in our hearts and minds through out the day. As I look back on my journey these three values were vital in all that I experienced and did. Before I left for my trip I remarked on how my faith would guide me through this journey. My faith was an important component of my trip and was deeply strengthened during my time in Chimbote. I was inspired by the faith of the Peruvian people both in their devotion at Mass and in the way that they carried out their lives. God was and is present in each of these people and it was clear to me in all that I did; in my commute to work where I would see taxi drivers gathered for miles waiting for hours to receive gas for their cars (there is currently a shortage in Peru), in the procedure room as I held the hands of patients having their wounds cleaned, in the faces of the newborn babies and the joy of their mothers when they first saw their child, and in each home that I visited in the barrios. Through these people I saw God and I found an even greater meaning and appreciation for my faith. The goal of my trip was to serve. 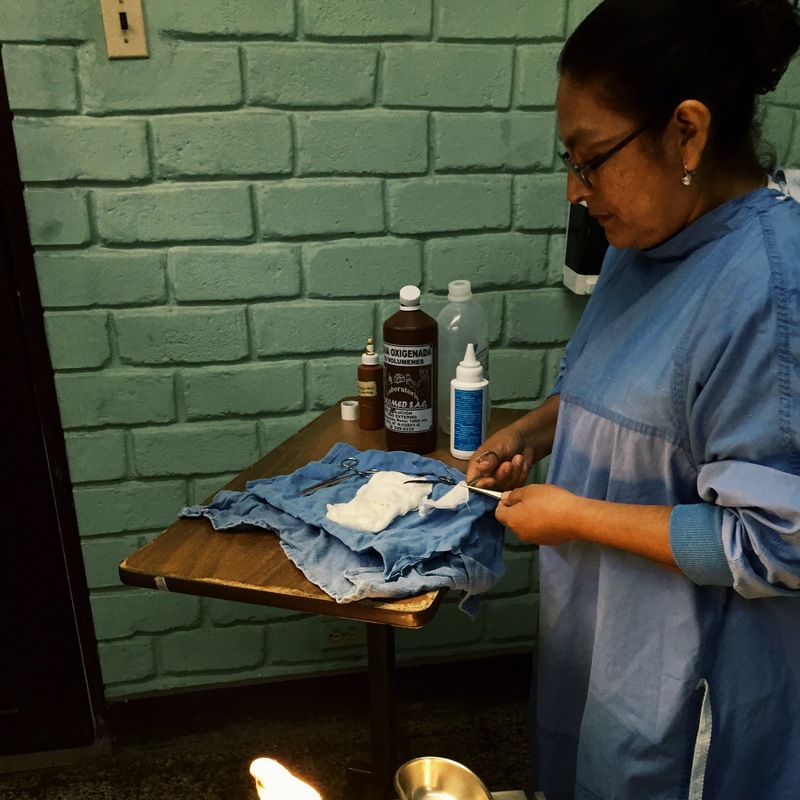 In my initial email to Sr. Lillian I wrote that I hoped “the clinic was in need of a college girl with a servant’s heart who wanted more than anything to have the opportunity to work with them in Chimbote.” I tried each and every day to embrace every moment and to live the message of the Gospel in all that I set out to do. 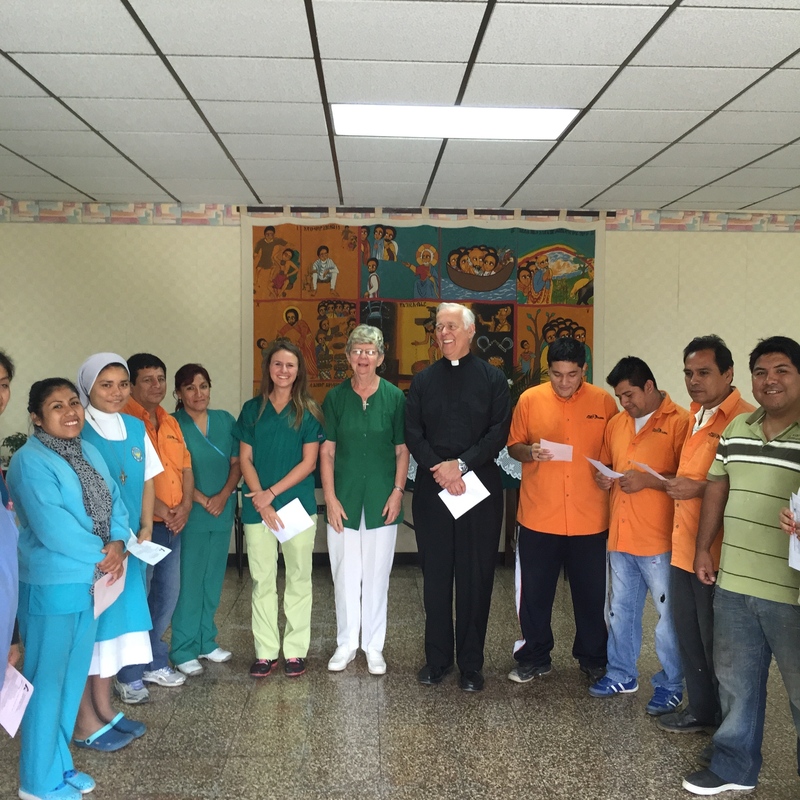 The mission statement of the center encourages all to “servir con amor cristiano“, to serve with Christian love, and I did my best to serve and to bring joy to the patients and families of the center both within their gates and in community. On Sunday morning I left Chimbote for Lima. I tried my best to remind myself that I should be happy and that I should be smiling. I said my goodbyes to everyone at La Casa and headed to spend my remaining time with the babies. I held Pedrito for the last time, fed Diego a cookie and danced in the kitchen with Angelita. It was in these simple moments that I was reminded of how truly blessed I was to have had these children and the people of Chimbote in my life. I was able to experience things at nineteen years old that some don’t get to experience in their lifetime. I was able to love. I felt love from these children as I kissed each one good night and as I walked in to the kitchen each morning to a choir of children gleefully yelling “hola Kate.” If I am sure of anything on my journey it is that I loved with my whole heart, and that I will continue to love these children and the people of Chimbote long after I return to Providence. The goodbyes were bittersweet for me, but I knew in my heart that it was time for me to go home. 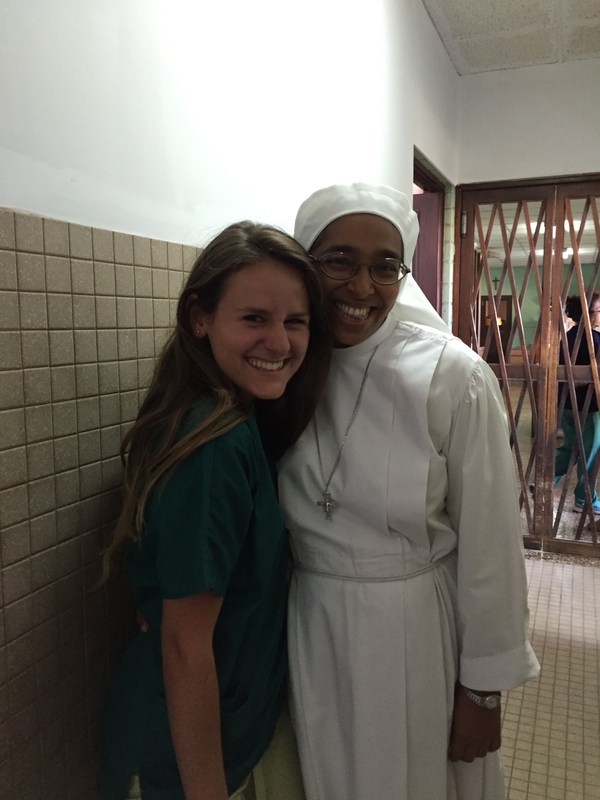 I am so incredibly grateful for this experience and know that it would not have been possible if not for the Father Smith Fellowship Program at Providence College, the extreme hospitality of Sister Lillian and Sister Margaret Mary and the Dominican Sisters of Grand Rapids Michigan, and the constant support and love of everyone back home. Thank you from the bottom of my heart for following me along on this incredible journey. May the love, faith, and strength of the people of Chimbote expressed through my stories remain in your heart for ever, because they will always remain in mine. 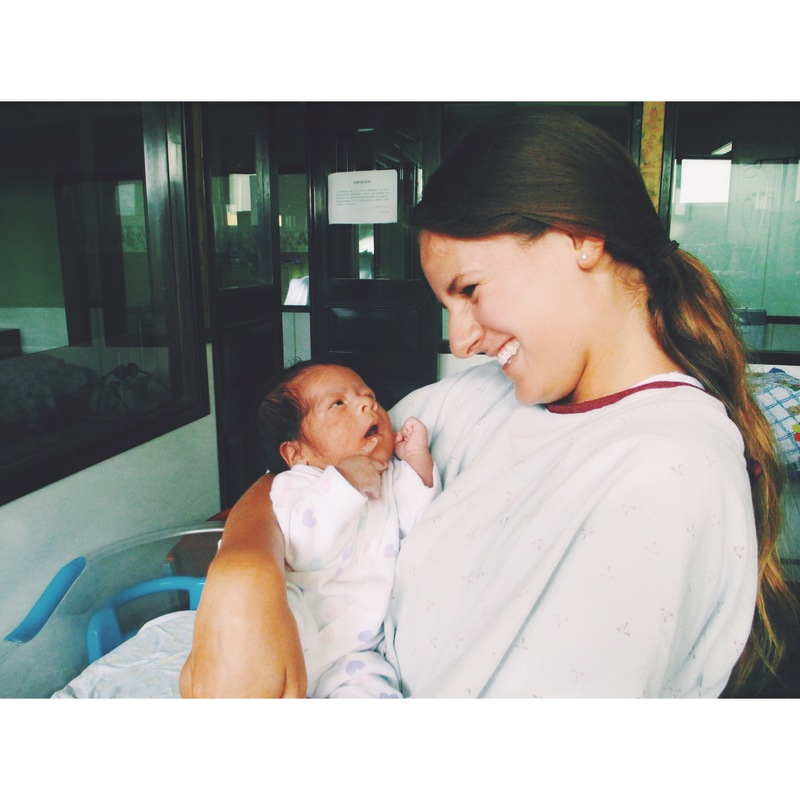 Last week I was placed in my toughest position thus far during my time at La Maternidad. My job for the day was to call patients in to see the Doctors… sounds pretty simple, right? No. I encountered two very large problems with this task: 1. all of the records at the clinic are handwritten and some of the handwriting was very difficult to read; 2. Peruvians have very long and very hard to pronounce names. With a smile on my face I proudly entered the waiting room to announce the name of the next patient, each person in the waiting room did not hesitate to correct me and to provide me with the proper pronunciation of the name. 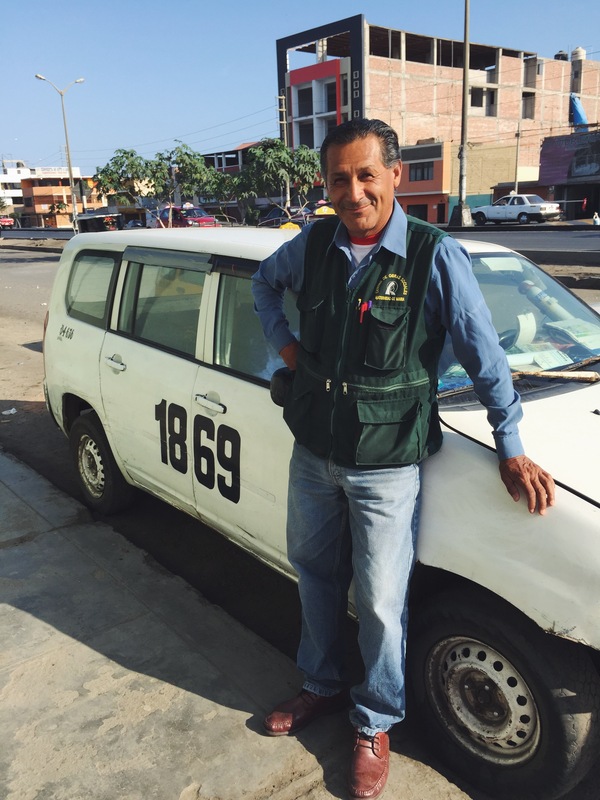 My struggles with the names made me realize how very patient and understanding all of the staff have been with me since the moment I arrived in Chimbote. La Maternidad is blessed with a staff comprised of some of the most kindhearted and dedicated individuals that I have ever met. Their love and pride for their work is seen in all that they do and felt the moment you walk through the door to the center. 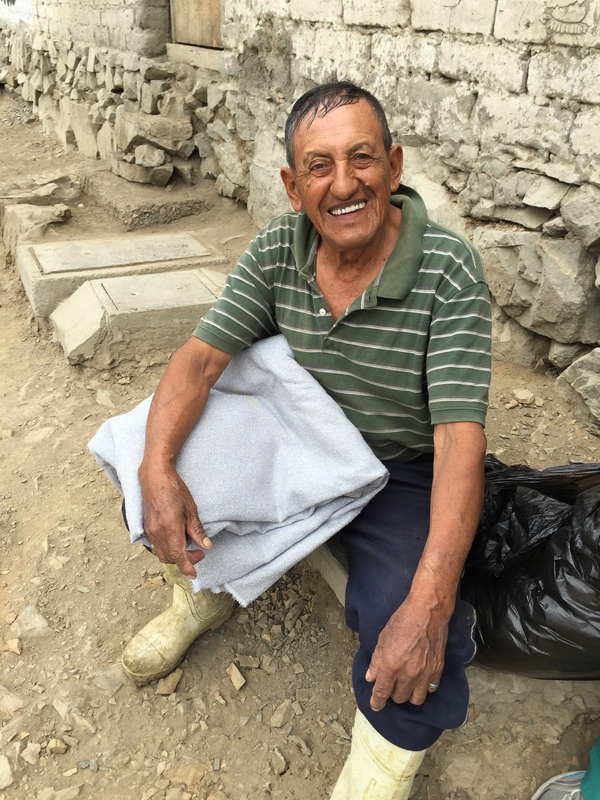 Agusto is always wearing a hat and thus has been nicknamed Berreta, and is the first person to greet you at the security desk when you enter the clinic. He is also the (very proud) owner of the white taxi used to take items too large to cary in our hands on home visits. His white taxi is falling apart at the seams but he is so very proud to chauffeur us around and to strike up a conversation with me when ever I walk past him. Earlier this week I was telling him how upset I was to be leaving Chimbote and how a piece of my heart will forever remain here after I’m gone. He responded by saying that my heart has influenced him and many here in Chimbote and that I will remain in his heart forever; his words meant more to me than you will ever know. I spend the majority of my time working in the clinic or with the orphans. 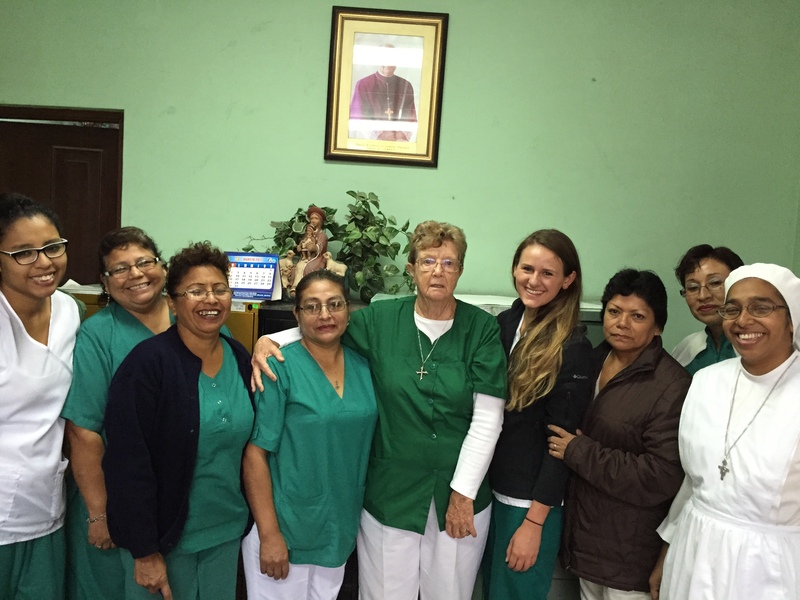 Each morning I am blessed to work with the sweet staff in la posta (the clinic). When you first enter you are greeted by Anabel. She records the patients information and then sends them back out into the waiting area until the Doctor is ready to see them. We have an amazing staff of Doctors at the clinic that work on rotating basis. They all have very different personalities and I have learned so much through listening to their consultations and watching them examine their patients. If you are in need of a change of dressing, a minor procedure or wound care you are treated by Juana. 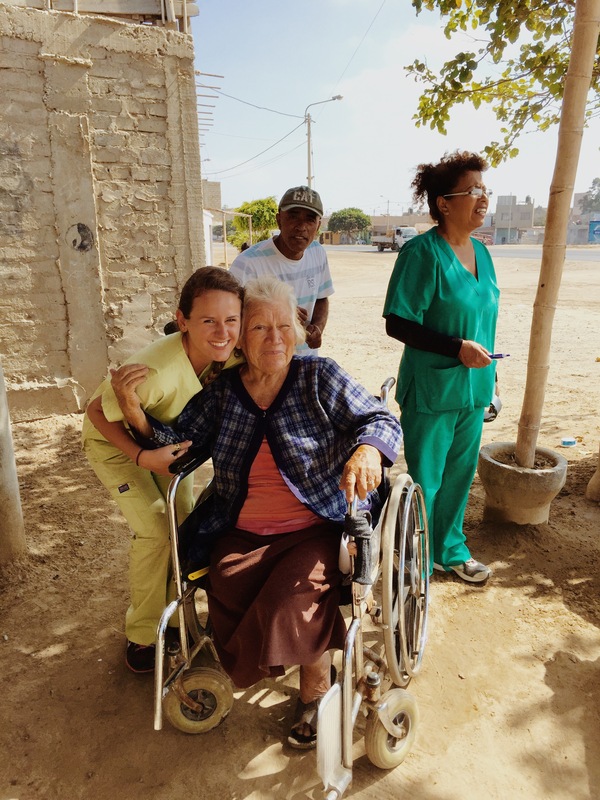 Juana’s door is always open for me to watch her treat the patients and on one not so lucky occasion I was her patient for the morning (not to worry, I was well taken care of and learned a valuable lesson on the importance of appropriate footwear while walking in Peru). I accompany Zoraida and Elizabeth on home visits. These two women selflessly give of themselves each and every day to provide care and concern for those who are not able to come to the clinic and the lengths in which they travel to provide this care is exemplary. 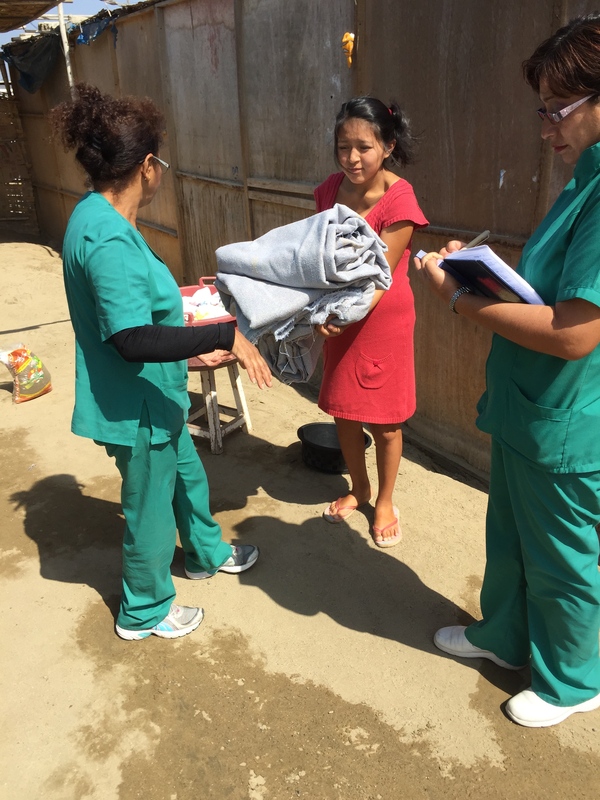 The love the people of Chimbote have for Zoraida and Ellie is evident on each and every home visit. Another worker in La Posta is Madre Jinsy. Madre is a Franciscan Sister from India who has been in Peru for almost a year. Jinsy is a registered nurse who gives of herself whole-heartedly to each and every patient that she tends to. She is an example to live by, and I am in awe of her selflessness and desire to serve. She lives in Nuevo Chimbote with two other Sisters from her Order. All three Sisters are so incredibly sweet and I have very much enjoyed the time that I have been able to spend with Jinsy in the posta and at her house. Each day I visit Pedrito, my now one month old little orphan boy, in the Neonatal unit. I have become very close to the girls who work in the unit, especially Nerrida the woman pictured on the right in green, and those who flock to the window to say hello while I am visiting with him. It has been so amazing to monitor his progress and growth over the past month. Earlier this week I went bouncing into the unit to visit and was shocked to find his bed empty. The nurses told me that he was no longer with them. 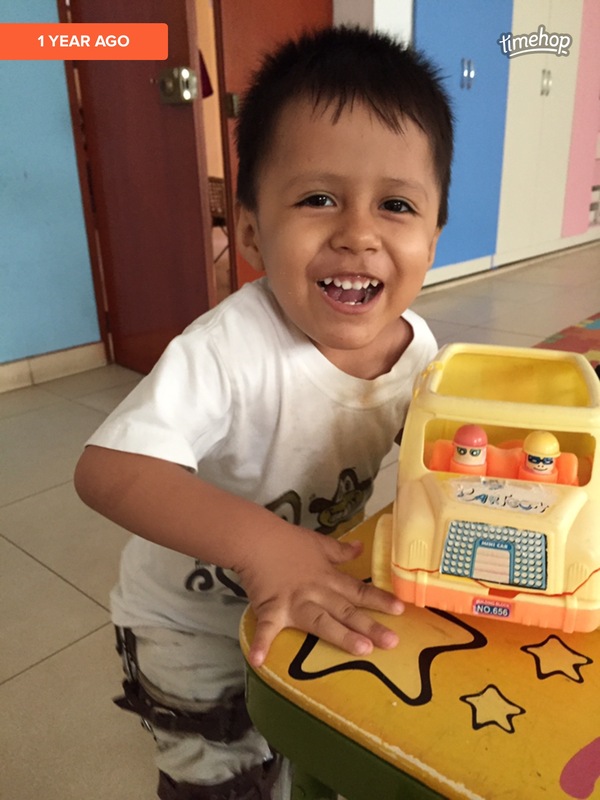 At first I was confused and wondered what this could have meant, but I soon learned that he had been moved to the orphanage since he had progressed so wonderfully and no longer needed to be in the neonatal unit. I am forever grateful to to the workers for their patience, their loving concern for the precious lives that they tend to each and every day and for their willingness to allow me to assist with feedings and of course for sharing their precious Pedrito with me. Last, but certainly not least, are Sisters Margaret Mary and Lillian. 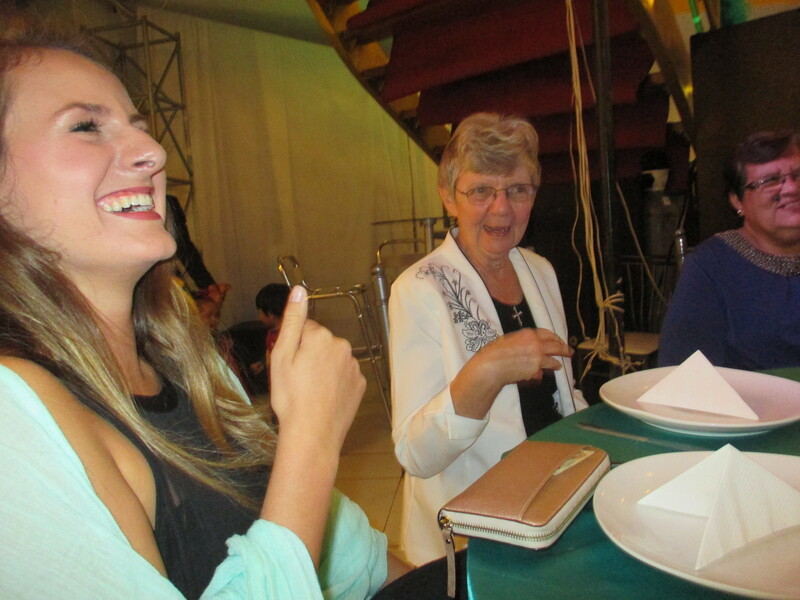 When I first reached out to the Sisters regarding their work, Sister Lillian responded with information that would help me determine “if you would like to become a part of our Chimbote family.” Little did I know back in November when I first received that email all that this family in Chimbote would entail. The Sisters have become a part of my family and I am forever grateful for their patience, love, laughter (and there certainly has been a lot), and for welcoming me into all aspects of their family. They exemplify the message of the Gospel in their day to day work, and their faith in God has served as a daily inspiration for me. I cannot thank them enough for their hospitality and for providing me with this incredible experience. As you can see, it takes a lot of people to run this clinic (there are 120 on the payroll), but it takes a family to provide attention and love that each patient receives when they enter the doors of the Maternidad. I consider myself extremely blessed to have been able to experience this love. Centro de Obras Sociales is truly an oasis of hope and love and I am reminded of these values each and every day as I serve alongside these wonderful people who have become “mi familia”.